I'm pleased to present Sensorially Challenged Volume 1, a book crammed with sensorially overloaded tales that ooze with purple prose. The book contains 100 sensory stories, written by 100 authors who submitted their aromatic, delicious, velvety, pretty, and noisy tales to Allen's Sensory Overload Writing Challenge. Sensorially Challenged Volume 1 is available in print and Kindle eBook formats. Proceeds from book sales will be donated to the National Literacy Trust, an independent charity that gives disadvantaged children the literacy skills they need to succeed in life. You don't have to own a Kindle to read this version of the anthology - you can download a free Kindle app that works on most modern devices. Sensorially Challenged Volume 1 contains 100 sensuous stories submitted to Allen’s Sensory Overload Writing Challenge. The challenge was conceived by award-winning editor, writer and poet, Allen Ashley. He works as a creative writing tutor with various groups across north London. The sensory writing challenge opened in March 2017. Sensorially Challenged Volume 1 was released in December 2017. At the time of writing, we've already received a lot of submissions for Volume 2. 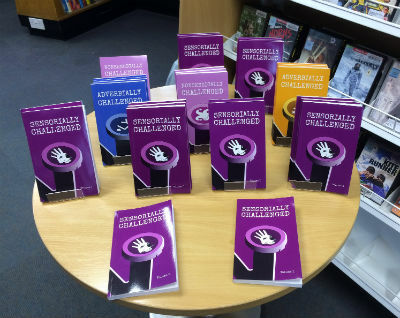 Sensorially Challenged Volume 1 is the fourth writing challenge anthology to be launched in support of charity on this website. You can find out how successful all the writing challenge book launches have been on the writing challenge book launch page. All the writers in Sensorially Challenged Volume 1 submitted their stories to Allen's Sensory Challenge. Abhi Shan, Abigail Williamson, Alan Barker, Alan Pattison, Allen Ashley, Amanda Garzia, Bee Grey, Ben Clarke, Betty Hattersley, Brandon Brown, C.I. 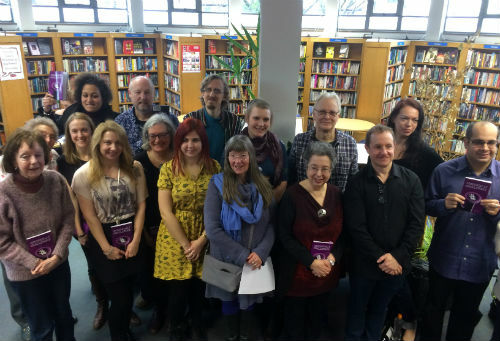 Selkirk, Carolyn Cahalane, Charley Swire, Christine O'Donnell, Christopher Fielden, Cosima Armstrong, Danielle Dayney, David Silver, Dee Tilsley, Diane Caldwell, Dolly Garland, Donna-Louise Bishop, Dora Bona, Eddie Regory, Ejder S. Raif, Elizabeth McGinty, Ellie Bignall, Emilie Lauren Jones, Etheray, Faye Minton, Fiona Jeeves, Frances Hay, George Kelly, Glen Donaldson, Glynis Ann Downey, Grace Howard, Helen Combe, Hema Nataraju, Ian Tucker, Jack Caldwell-Nichols, Jack Hanlon, Jack Probyn, James Moore, Jayne Buckland, Jennifer Chislett, Jerry Wilson, John Briscoe, John Notley, John Wilks, Jonathan Macho, Joseph Hancock, Josie Gowler, Karen McDermott, Karen Vernon, L A Moylan, Laura-Liisa Klaas, Lauren Kearney, Lesley Truchet, Lizzie Merrill, Louis Cennamo, Louise Burgess, Lynn-Marie Harper, Mab Jones, Maddy Hamley, Maggie Elliott, Margaret Edwards, Marilyn Thompson, Mark Lewis, Martin Strike, Melony Boseley, Michael Rumsey, Michelle Konov, Mike Scott Thomson, Namita Mukherjee, Nicole Loh, Nicole McIntosh, Norman Longworth, Paige Vest, Patricia Mudge, Paul Phillips, Robert Stewart, Ros Byrne, S.W. Hardy, Sandra Orellana, Sandra Phillips, Sandra Unerman, Sara Roberts, Sarah Peloquin, Sivan Pillai, Stuart Lanigan, Susan Powis, Temmy Oj, Tim Baker, Tina Smith, Tracey Maitland, Tristan Bolton, Vaibhav Rathi, Victoria Simons, Wayne Hewitt and Yvonne Mallett. For every book sold, £1 will be donated to the National Literacy Trust. 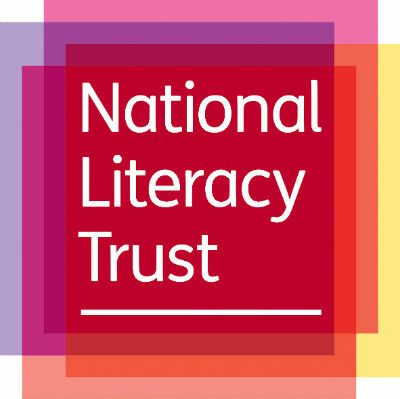 You can learn more about National Literacy Trust on their website. You can also find out how many authors have been published via the writing challenges, and see how much money we've raised for charity, on my main writing challenges page. All the statistics are updated monthly. If you'd like to submit a story to the sensory writing challenge, you can do so here. Every story submitted is published on this website. Each time we receive 100 stories, we'll publish a book like this one. 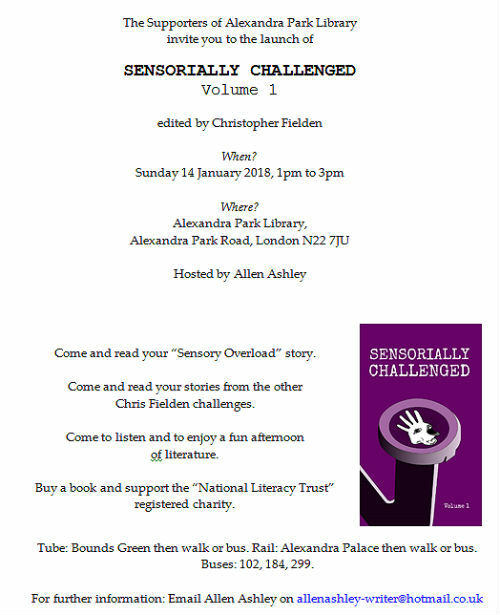 Book launch for Sensorially Challenged Volume 1 took place on Sunday 14th January 2018 at Alexandra Park Library, Alexandra Park Road, London, N22 7JU, UK. The event was hosted by Allen Ashley. Alan Pattison, Allen Ashley, Carolyn Calahane, Chris Fielden, Donna-Louise Bishop, Ejder Raif, Emilie Lauren Jones, Frances Hay, John Wilks, Louis Cennamo, Lynn-Marie Harper, Mike Scott Thomson, Nicole McIntosh, Sandra Unerman, Sandy Phillips, Sara Roberts, Tina Smith and Yvonne Mallett. Allen also read stories by Clair Selkirk and Namita Mukherjee, who were unable to attend in person. 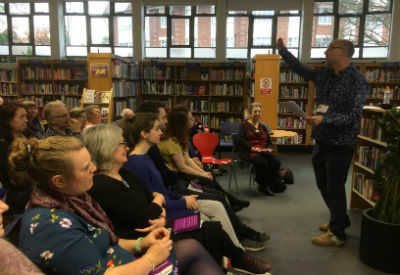 You can find a full write up of the event on the writing challenge book launch process page, which includes more splendid photos. 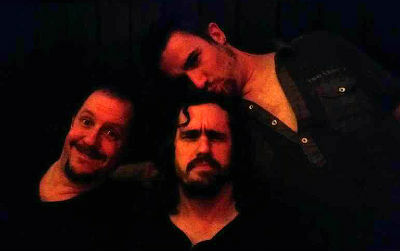 You will also find LOADS of photos on the Facebook event. And finally, for the sake of history, here is the poster from the event. 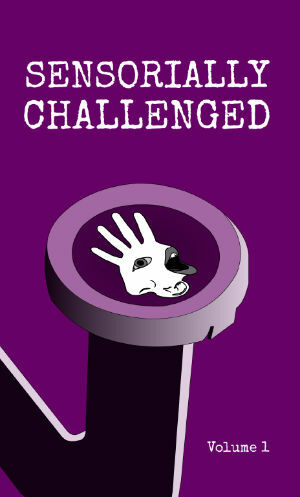 The cover for Sensorially Challenged Volume 1 was designed by David Fielden. A purple cover seemed appropriate, seeing as all the stories in the book are stuffed with purple prose. Dave is my brother. He is one of the luckiest people on the planet. Because I'm his brother. How many people have brothers that make them design book covers all the time? And share pictures of them being kissed on the head? Not many. Lucky, I tell you. Blessed. Dave also designs websites. You can learn more at Bluetree. It has been really lovely working with Chris who is efficient and inspiring. I look forward to reading at the launch. I'll look forward to seeing you at the launch! Hi Chris. I hope all is well. I'm sorry I didn't get to the book launch but I was wondering if there's anywhere I can buy the book without using Amazon? Hi Tim. I’m afraid not… Amazon print and distribute the book. So even if you buy one from me, it still comes from Amazon. Are you asking because you don’t have an Amazon account? Or because you don’t like buying from Amazon? Hi Chris. It's because it's Amazon. I could easily have a rant but won't... it's about their business and employment practises so I just don't use them. Hi Tim. I totally understand – many people feel like that about them, including my family. I think my father is probably their biggest un-fan (or whatever the opposite of advocate might be). However, their author platform is the best out there (in my opinion) so I use it. 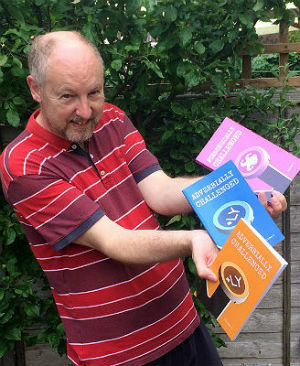 It’s the only way to provide these books with very little upfront costs and distribute them on a platform that generates sales and, therefore, the cash for charity. I’d love to use something independent, but am working with 0 budgets unfortunately, so can’t. Sorry about that. No worries, Chris, I totally understand your situation too - I think what you're doing is great and I'm pleased to be a small part of it.